Humans augmenting themselves with mechanical, robotic or bionic parts is a popular trope in science fiction, and for a long time this has seemed so futuristic as to be out of reach. However, for the first time a team of researchers at the University of Minnesota has fully 3D-printed an array of light receptors on a hemispherical surface. This discovery marks a significant step toward creating a “bionic eye” that could someday help blind people see or sighted people see better. 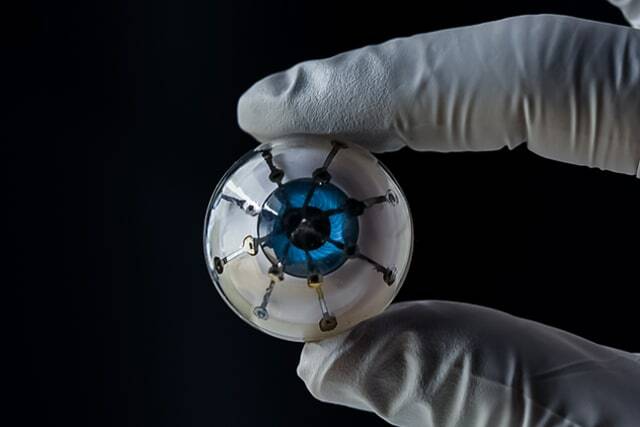 “Bionic eyes are usually thought of as science fiction, but now we are closer than ever using a multimaterial 3D printer,” said Michael McAlpine, a co-author of the study and a professor of mechanical engineering at the University of Minnesota. McAlpine and his team are known for integrating 3D printing, electronics, and biology on a single platform. They received international attention a few years ago for printing a “bionic ear.” Since then, they have 3D-printed life-like artificial organs for surgical practice, electronic fabric that could serve as “bionic skin,” electronics directly on a moving hand, and cells and scaffolds that could help people living with spinal cord injuries regain some function. The full research paper is entitled “3D Printed Polymer Photodetectors,” and can be found online at the Advanced Materials website.